Yesterday was the last Explore! for the year and the last Monday session ever. 2pm on Mondays does NOT work for our community. So, we’re (read: I’M) letting it go and my co-worker will continue Explore! on Thursdays. Eventually, I will catch up on all my sessions (there are several I haven’t blogged yet) but this latest was SO much fun and perfect for this time of year. It even snowed last night! Which hardly ever happens! We had a lot of fun talking about all the supplies used to make the snow people and animals in the book. 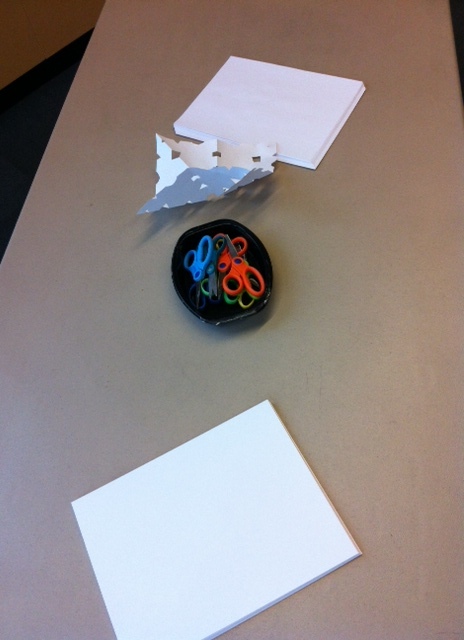 Parents were instructed to experiment with folding and cutting and see what they come up with. Kids were totally blown away watching their parents unfold the paper to reveal a snowflake. I have to remind myself sometimes that these are 3 and 4 year olds and may have never seen a paper snowflake being made. Make a snowman using the supplies on the table. Some used only marshmallows and toothpicks, others glued things to the cardstock to create a whole winter scene. Start with some shaving cream on the tray. 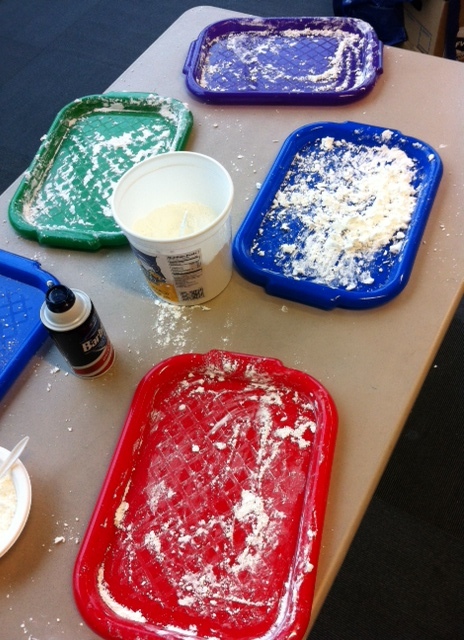 Kids add corn starch until it reaches the consistency they like. I had a bowl of pre-made snow on the table as well so they would have an idea of what they were aiming for. After they get a good consistency they could mold it into snowballs and everything. It even felt a little cold! Most wanted to take it home so you might want to have baggies on hand as well. This was the most popular station for all but one little girl who just cannot tolerate messy hands. Categories: STEAM | Tags: preschool, steam, stem | Permalink. For October we are focusing on weather, kicking it off with rain since it does a lot of that here. Ugh. I mean, yay! Introduction: This program has now been going for a whole month! The basis for the program is STEAM, which stands for Science, Technology, Engineering, Art and Math. We hear from teachers that kids could use extra help in these areas and Art is there because many schools aren’t doing as much with budget cuts. I mostly hope kids will have fun, be encouraged to ask questions, and that you might get some ideas for activities to do at home. So here’s an overview of what we are going to do today. I wanted to use this book in particular because of all the great sounds it makes. I explained this to the group after we read it. Great for vocabulary and pleasing to the ears. This app is super cool. I put it on my Galaxy Note (it is available for IOS) and plugged it in to the ceiling speakers in the room. It sounded like the rain was right on top of us. So cool! I showed them the image that went with each sound, but mostly we talked about the sounds. The most popular words were pitter patter and drip. There were only 6 kids so that’s OK. They really enjoyed listening to it and were surprised that the thunderstorm rain was quieter than the rain on the tent sound. I also gave a short message here about using technology together so kids get more out of it. Lots of big head nods to that. 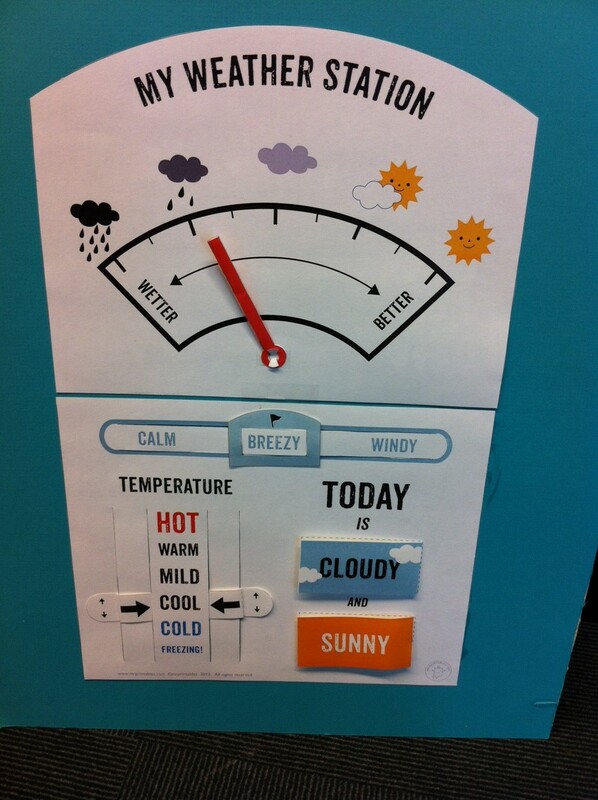 My coworker made this beautiful weather station so we used it to talk about the weather today. We also had a big calendar printed out so we could mark the weather on that so we can keep track from week to week, but the calendar at the wrong dates on it. Oops! Next time. Shallow trays with a little bit of water in the bottom were set up on the table. 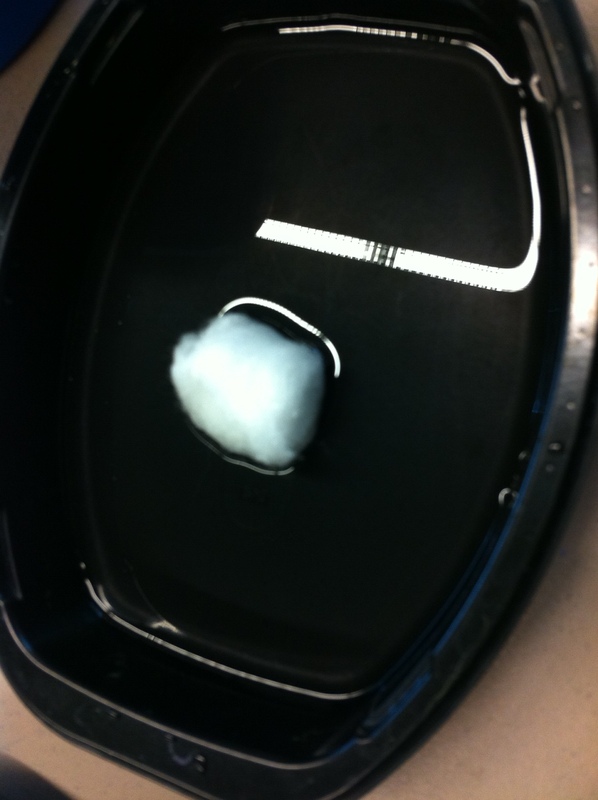 Cotton balls were in a container in the middle along with some eye droppers. 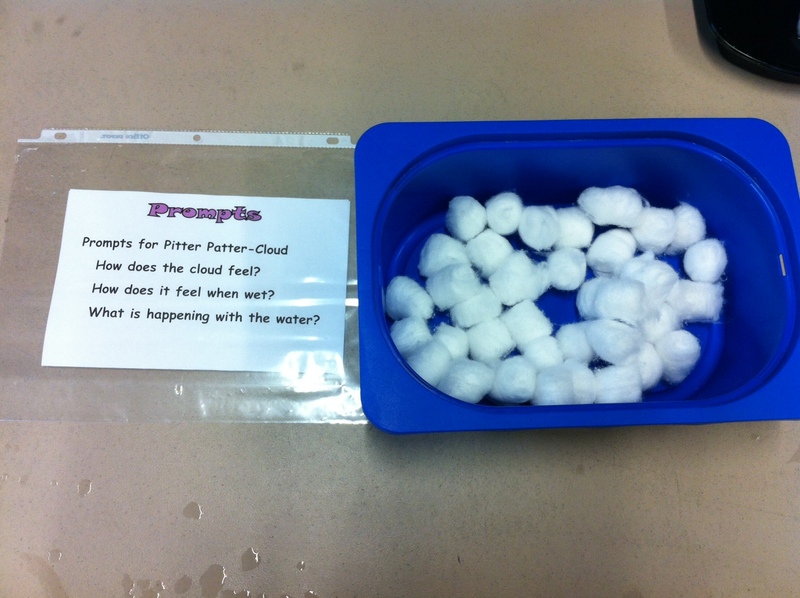 Kids took their “cloud” and either squeezed water on it with the eye dropper to make it rain, or dipped it in the water to fill it up until it bursts. Just like a cloud! 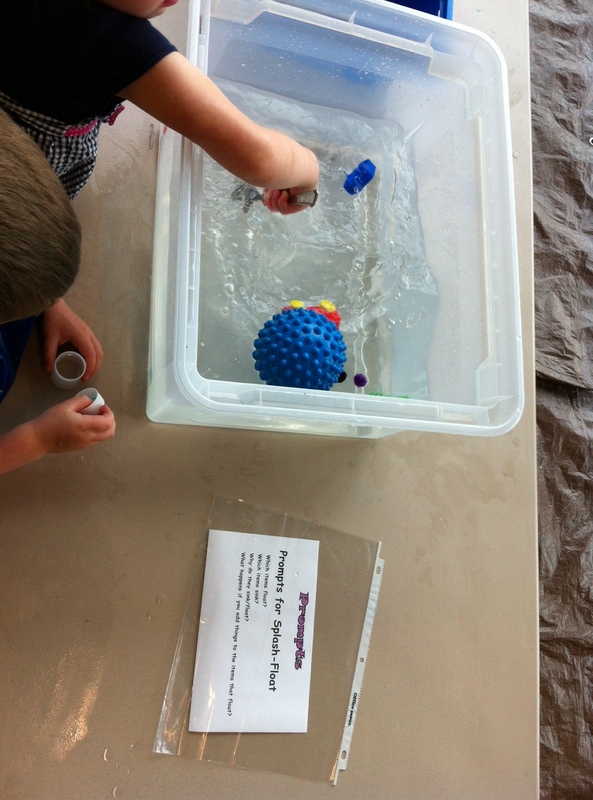 The kids were totally amazed that it got smaller when they wrung it out and bigger when it was full of water. They spent the most time at this station filling their clouds and “making it rain”. 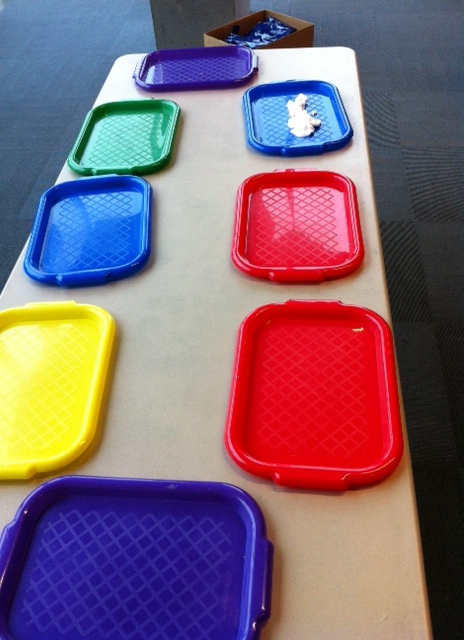 This idea came from Amy at The Show Me Librarian. I wanted them to have their individual clouds to work on so instead of a tub I used clear cups. 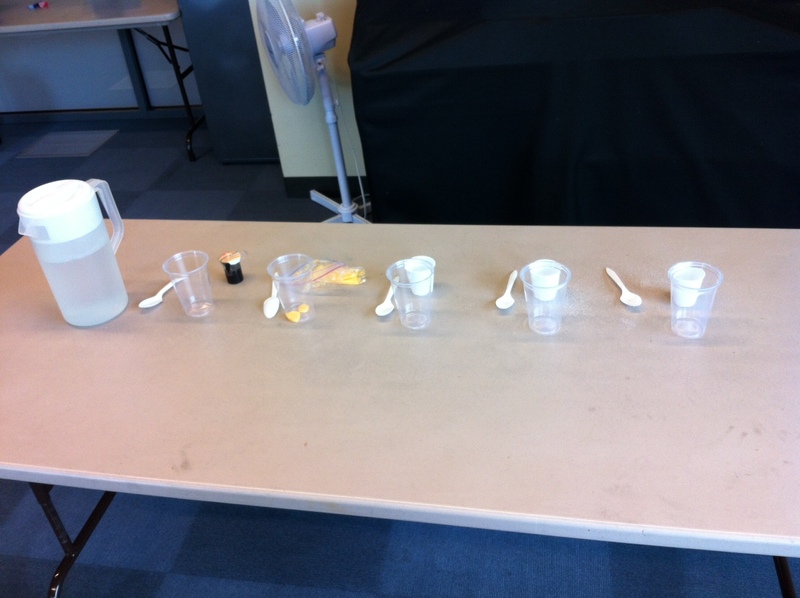 Each cup was about half full of water and I squirted some shaving cream on top of the water for each child. They used eye droppers to drop liquid watercolor on top of the shaving cream until the color broke through the “cloud” and rained. The only reason they didn’t stay forever here is that parents wanted them to stop filling their cups with watercolor. Even though I said it was fine. They tried different colors to make a “rainbow that looks like ice cream”. Can you guess which of these was my demo and which was the 4 year old’s? Just some rain sticks on a table. That’s it. They loved it. Sometimes simple is good. 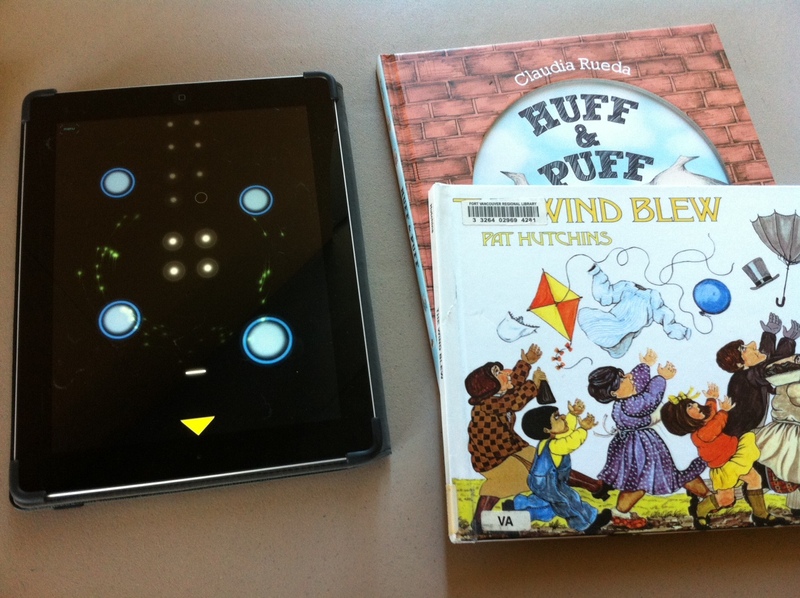 Categories: STEAM, Storytime | Tags: steam, stem | Permalink. 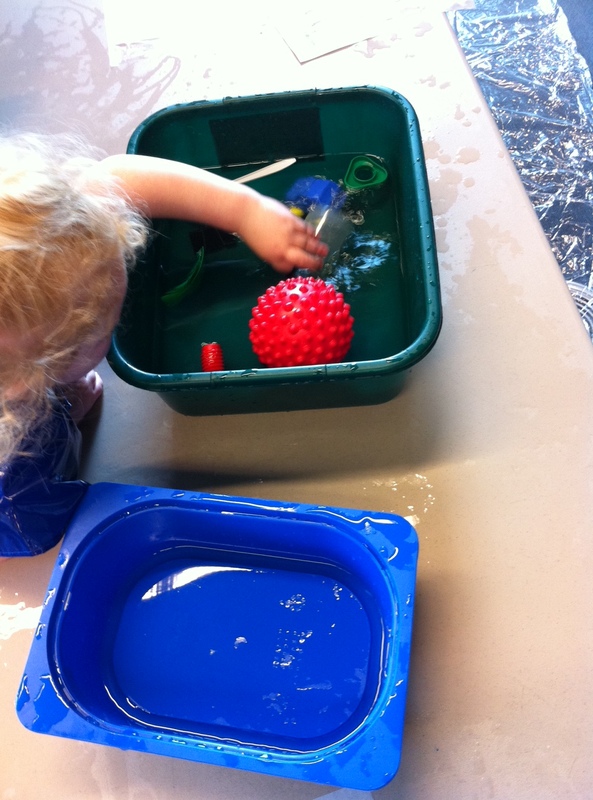 This week’s program focused on water. You probably figured that out from the name, but I’m Captain Obvious today. I got to do both sessions this week, which was great since there were some things about the Monday session I didn’t think worked so well. They were fixed in today’s program. Even though this is a book I would usually share with toddlers because it’s short and simple with lots of opportunities for movement, I knew preschoolers would like, too. With the older kids I focused on asking more open-ended questions I knew they could answer and getting their help in telling the story. For example: “Why do you think they want to do it again?” and pointing to the animals and letting them say “dog”, “cat”, “pig” and “duck” instead of me every time. This song is ALWAYS a hit. We swam all over the room and only occasionally swam in to each other. This is a great song for following directions. Usually, I just do one book so there is plenty of time for playing, but I just happened to have this on the table for today’s session (I sang it in the preschool storytime right before Explore) and since there was a seal in Splish-Splash, HAD to pull it out. 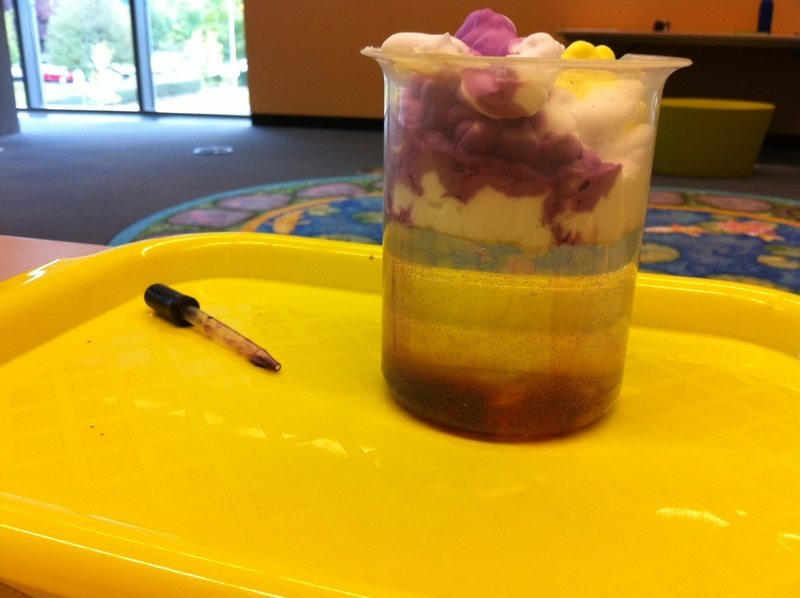 The idea for this activity is to see what kinds of things dissolve in water and what kinds of things do not. And, of course, to define “dissolve”. In Monday’s group I let each child do their own test. They had little cups with sugar, beans, and rice plus a big cup with water. 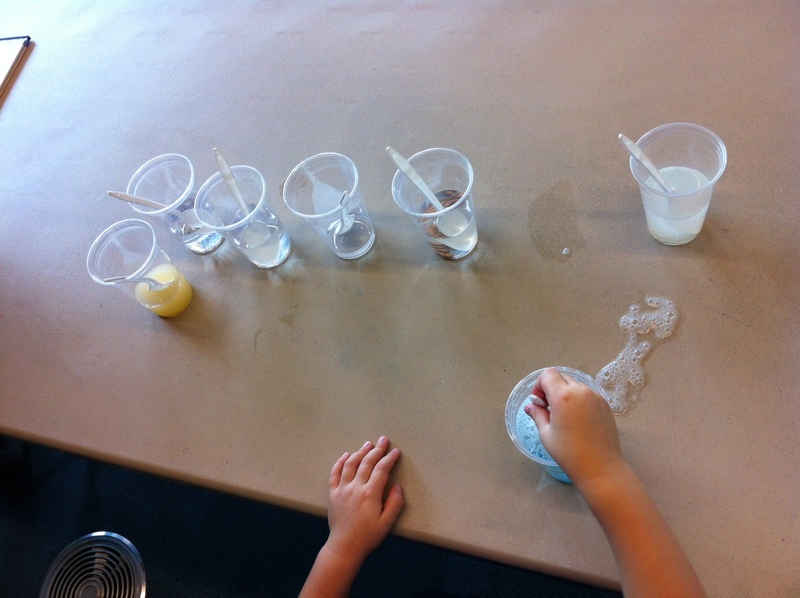 They dumped each item into the water and stirred to see what would happen. Grown ups were directed to ask them what they thought would happen before they put their item in water and then talked about what actually happened. It was great, but there were only 8 kids. Thursday there are more like 25-30 kids. So, I knew I’d have to think of something else. In Thursday’s group I did a demo, but had the kids help me. I pick a couple of special volunteers to be in charge of stirring and all the other kids just gathered around to watch and talk about what was happening. This way I was able to do more items, too. 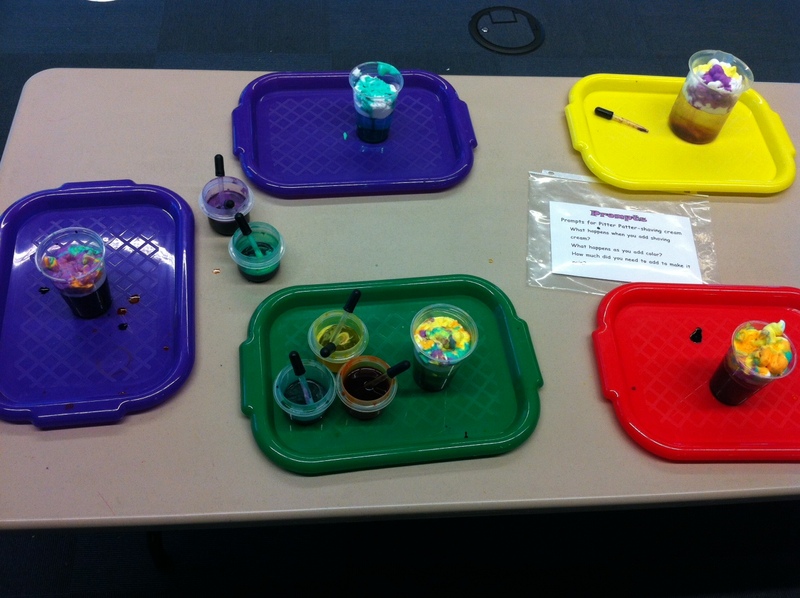 We had beans, rice, sugar, glitter, flubber (from our first week), salt, and dish soap. With each item I asked if they thought it would dissolve, or “go away”, or if they thought it would stay whole. They pretty much thought every item would go away, and only a few did. They were totally amazed. 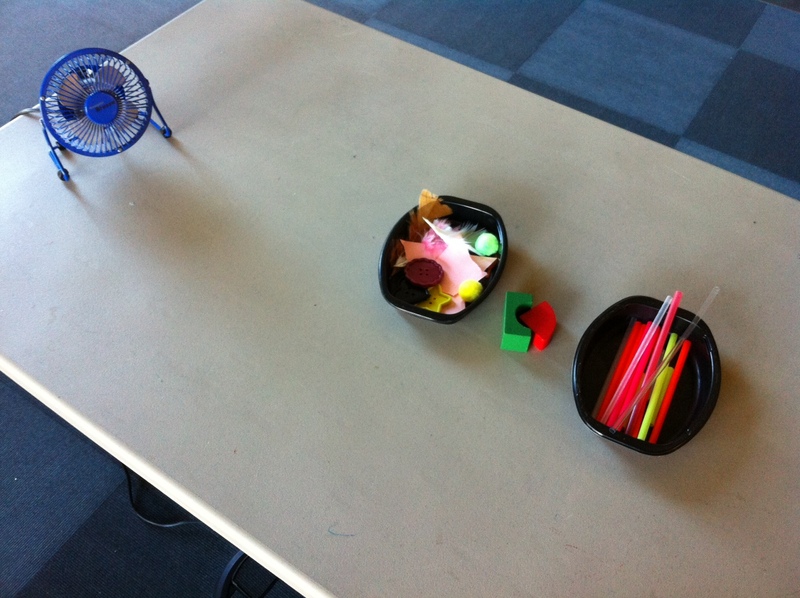 I left the cups on the table so they could keep stirring and talking and a lot of them wanted to do that. I split the group up in to 2 groups and sent them to the next station. Pretty straightforward! 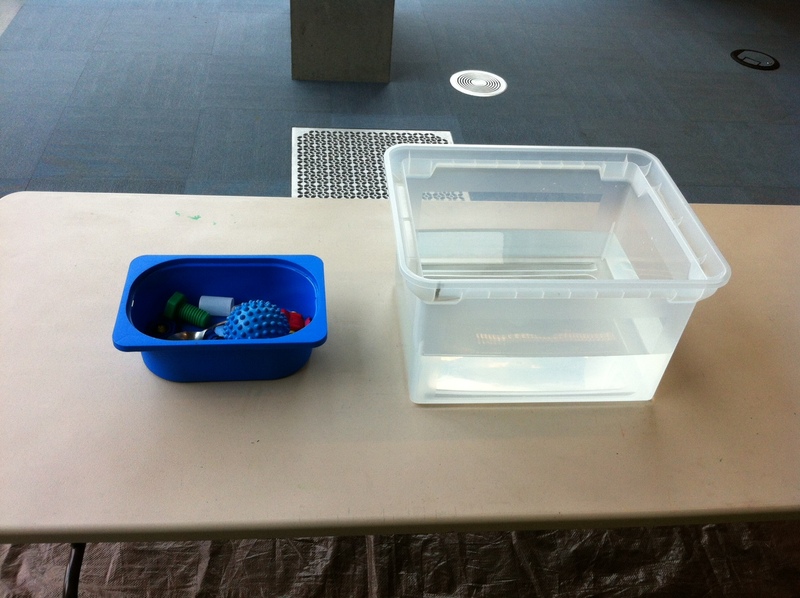 A tub with water and a tub with items. Each child/family got a paper with a chart asking them to write down their predictions (another great word to define!) and what actually happened. They mostly just wanted to play in the water, which was totally fine. They were talking about what was happening with everything they did. The pom poms got so wet you could wring them out and one girl was asking her mom why that was happening. I didn’t hear the answer, but I bet it was a good one. 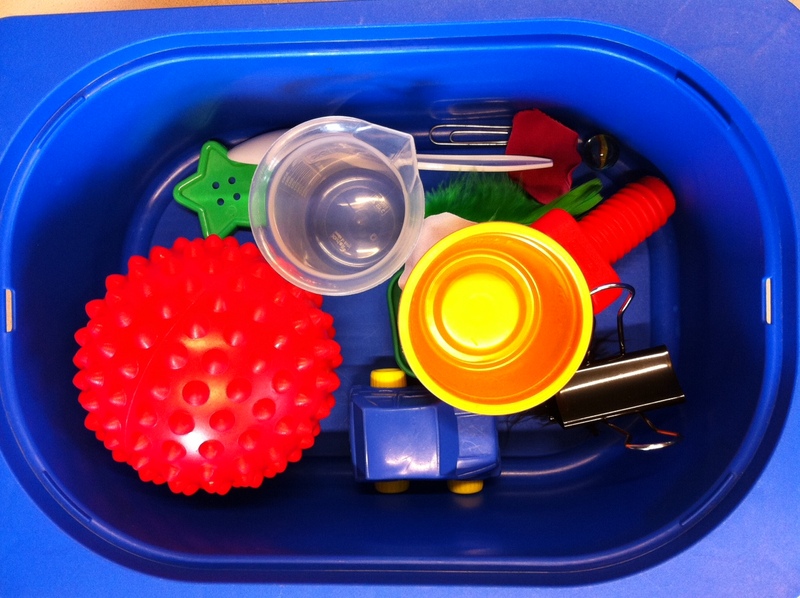 On Monday I had bins for them to sort the items that sunk or floated. With such a large group on Thursday I didn’t bother with asking them to sort. Plus, there isn’t enough room on the tables for that much stuff plus the kids. People checked out books, asked questions and had a great time. Another SUCCESS! 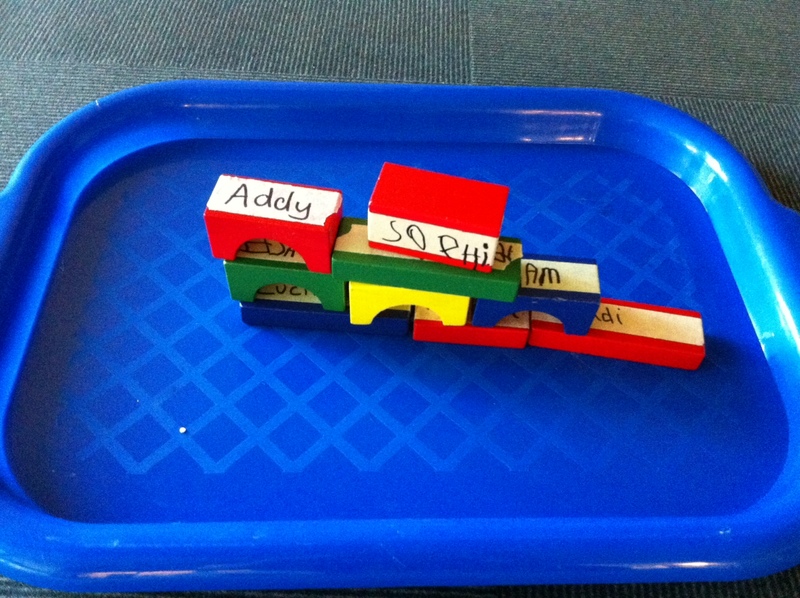 As families came in, children wrote their names on these wooden blocks and took them to the storytime rug where they sat on a lilypad, fish, or stone. 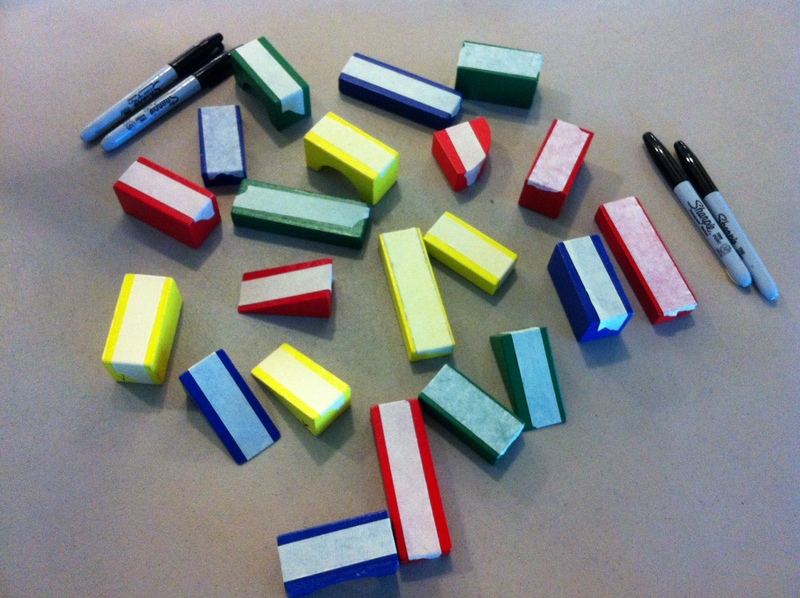 The blocks idea came from the Library Makers blog. 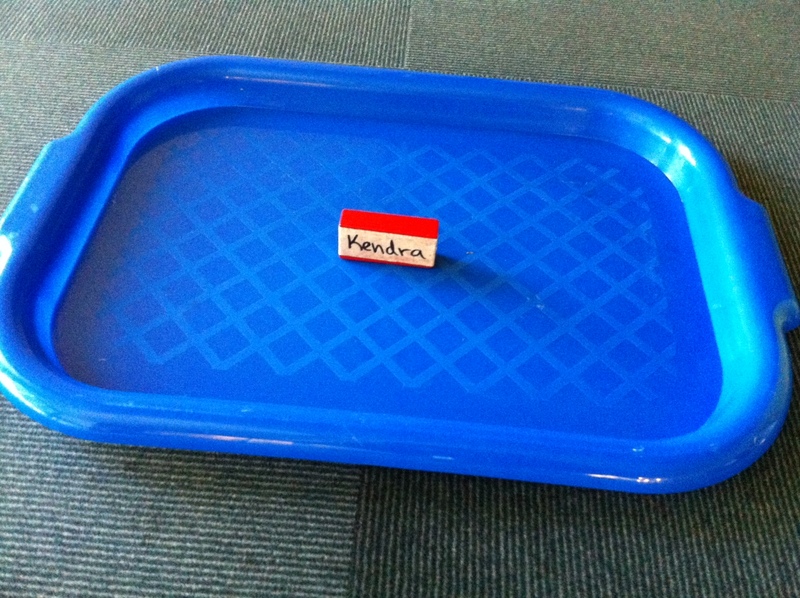 I then invited those 3 children, and only those 3 children (this is great patience and taking turns practice, parents) to come up to the tray where my name block was sitting and add their blocks to it. They chose to stack it like a tower. Then I asked them to sit back down and we did the next 3 names and so on until everyone had placed their block. 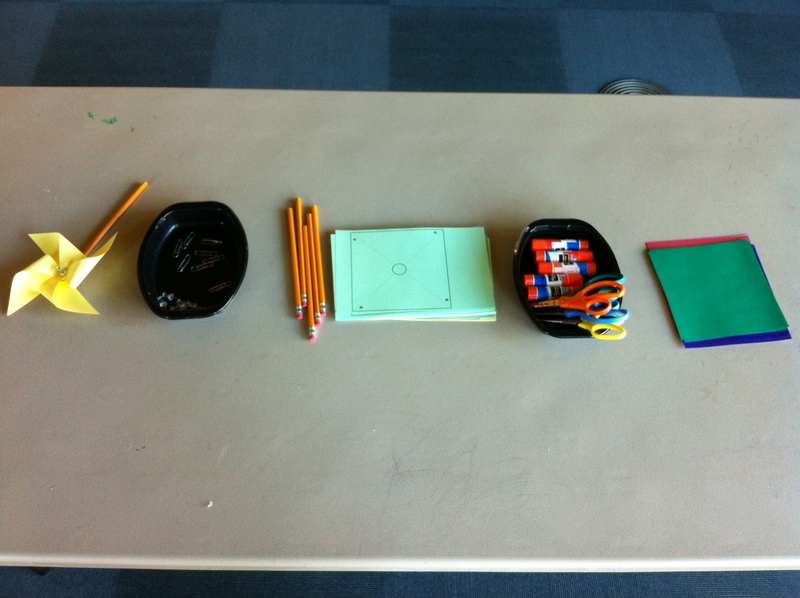 As Library Makers mentions, the engineering part of this activity is awesome. I did not rush the children as they were having great conversations about where to put things after the tower collapsed everyone had to come back up and fix it. They had a LOT of fun working together on that one. Best part: one girl asked which was her block and I picked it up and said I think it is this one because it has the first letter of your name on it. She said “Yes, the M!” and pointed to the letter. Work those literacy skills, little ones. After the tower was all fixed up we sat back down for another song and a story. This one is sung while getting a beat on your knees. We repeat on our heads and tummies. I explained the activity to the children and parents, emphasizing that all Explore activities are designed to be done with parents and children working together. 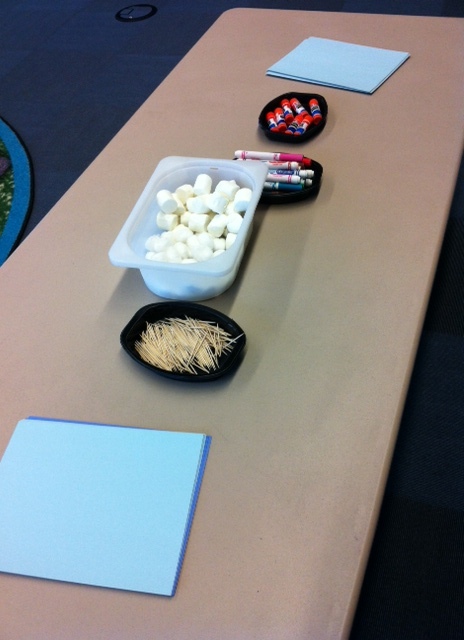 We have prompts on the tables in case parents want some ideas for questions to ask their children while exploring. 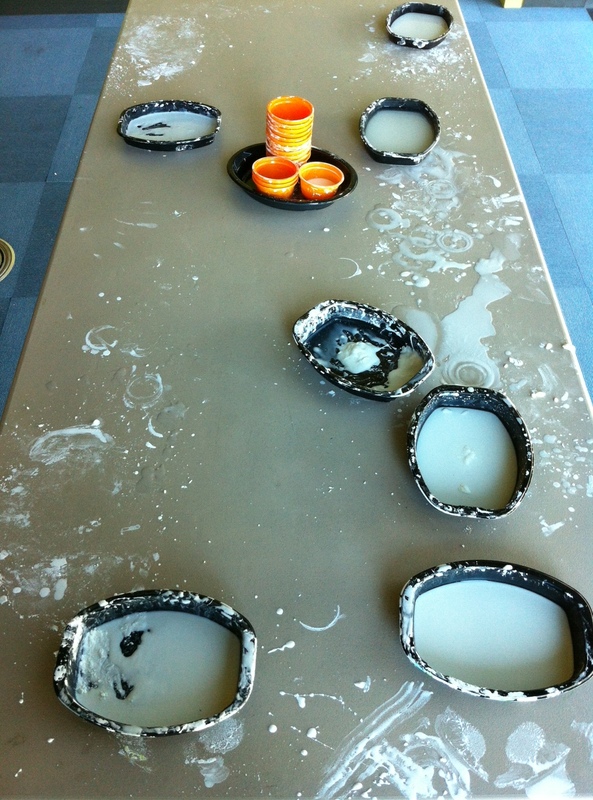 Corn starch was placed in orange dishes and there were pitchers of water on the tables. Kids dumped the cornstarch from the orange dish to the black dish they were given and took some time to play with the corn starch by itself. Some kids (like me) did not like the way it felt but others loved it saying it felt soft. Then they added water. Some added too much and had to decide if they needed more corn starch (I had more on hand to add upon request). That meant asking their neighbors what was happening to theirs and asking me whether it was right. I described what it might feel like and if they didn’t feel that they might need to add either water or starch. In the end they all ended up with white goo they were happy with. One boy could NOT understand why it felt like he could pick it up but then it “went away”. It was fun to watch him try over and over. After they were done with Oobleck I had baggies of orange Flubber (aka Gak) for them to play with and then take home. Originally I was just going to have them take them home as I thought they would spend more time on the Oobleck. I’ve noted that for future programs we should have 2 stations of activity. 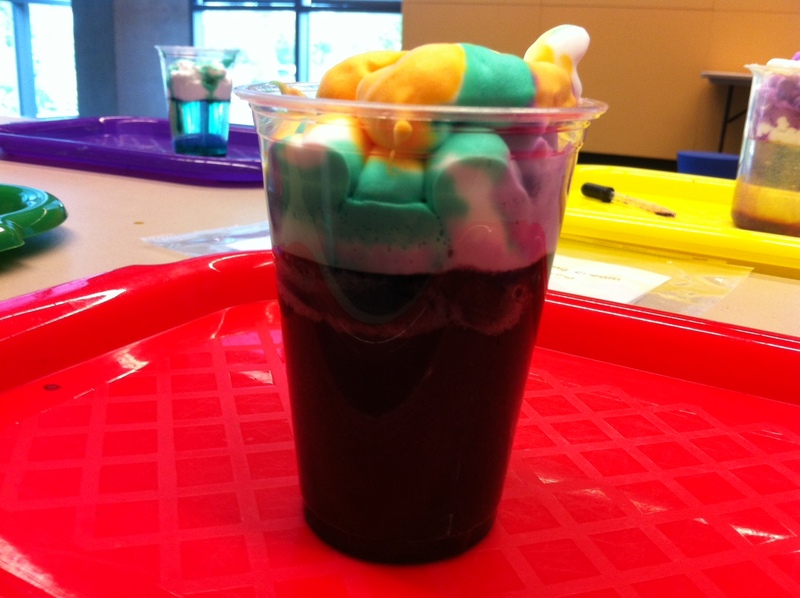 I also had some Flubber and 2 Ingredient Slime for them to play with if they wanted to save their Flubber for home. People left gradually after having their fill of Oobleck and Flubber, but not before I handed out Explore Journals suggesting to parents that they ask about what they saw, heard, felt today and let their kids write or draw about it in the journal. They can add an entry each week after they attend the program. My coworker will repeat this program on Thursday. 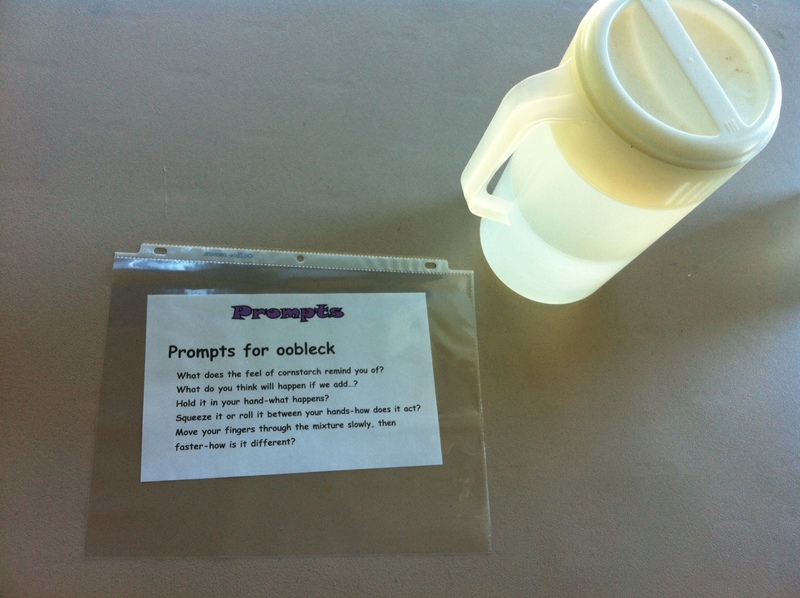 *Note* We planned to have the kids playing with Oobleck the whole time. 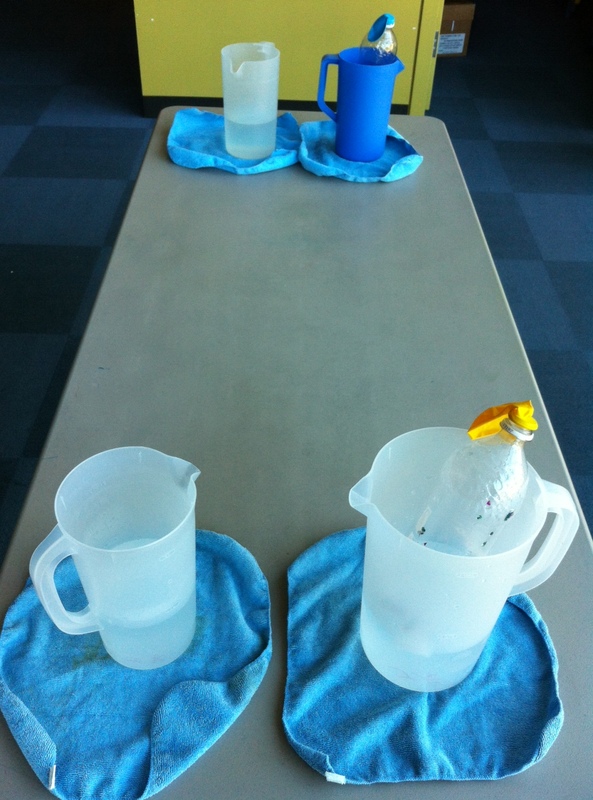 But that did not keep their attention so at the last minute I added the Flubber free play, We’ve decided for future programs we need to have 2 stations of activity for them to move between. 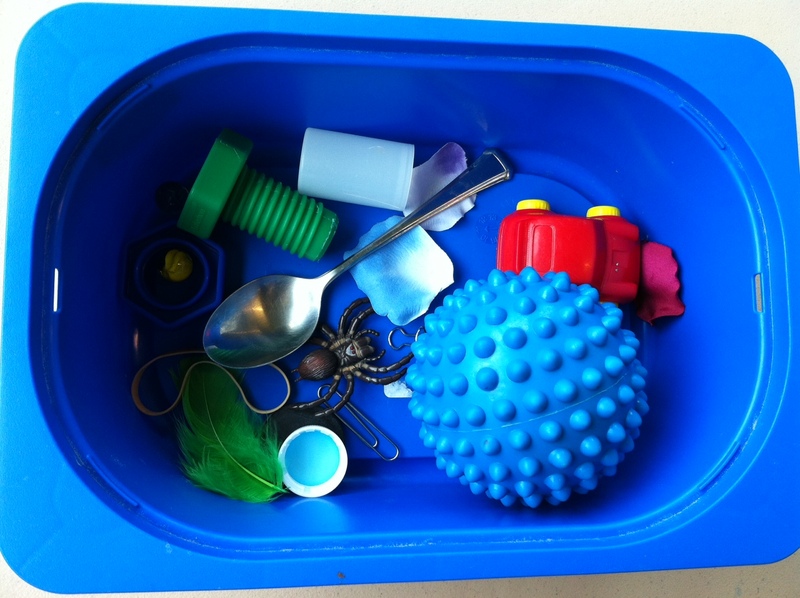 Since 3 year olds are in a different place than 6 year olds it makes sense to provide a station-like atmosphere so those who need to vary their tasks can and those who want to focus on one thing for an hour can do that. 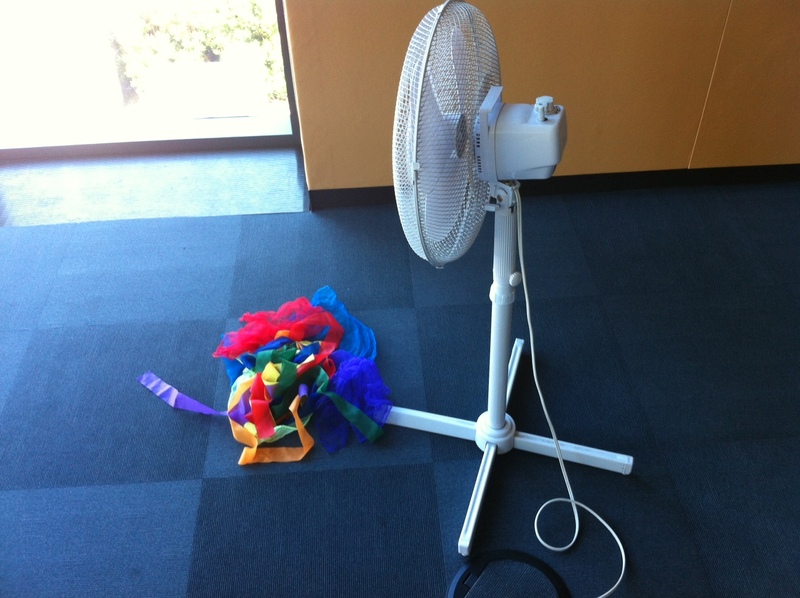 Categories: Other Library Stuff, STEAM | Tags: preschool, steam, stem | Permalink.